Bank holiday weekend is over and now summer is approaching and everyone is looking for a way to tone up, lose that last a few pounds as well as get a beach body. I have been looking for ways to lose and shift a few pounds as I am planning a trip in June/July. I have tried various types of dieting however I have never been able to stick to any of them! I do try and go to the gym but being at Uni and working during my free time, I am pretty much restricted to doing workouts in my rooms as I don't have much time. Uni definitely does not help a little bit while trying to lose weight! I always find that I am always eating out, ordering takeaways and just being too lazy to cook! I spoke to one of my best friend and she mentioned Slim Fast and that she has had great results with it! This was a few weeks ago when Superdrug had the products for half price. I actually ordered £15 worth of products so to last me a good two weeks however I ordered it to my Uni address and their post office has been closed therefore I ended up getting a refund instead. At the moment I weigh 9st and 4 and 1/2 pounds. I am hoping to drop down to somewhere in the 8st range. My main reason for trying out Slim Fast is because it's so convenient! Like I said being at Uni it is hard to maintain a diet and I like to throw things into my bag without having to get up early and prepare food. 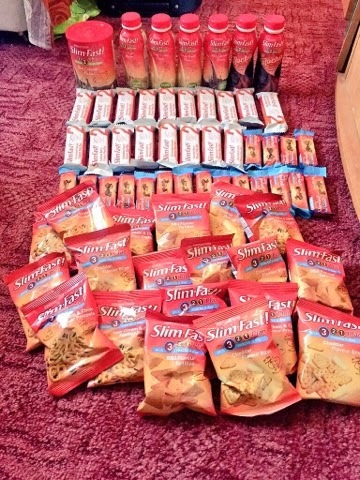 Slim Fast has meal replacement shakes, powders and bars as well as snacks like crisps and snack bars. There are plenty of flavours such as vanilla (my fav! ), chocolate, strawberry, mocha, cafe latte (another fav! ), banana and caramel temptation which comes in powder form. I normally use almond milk or coconut milk by alpro to minimise the calories. The shakes and powders are full of vitamins and proteins. The meal replacement bars come in three different flavours which are chocolate peanut, chocolate crunch and summer berry. I must say they all taste delicious! There are 210 calories per each meal bar. The snack flavours are sour cream and chive pretzels, cheddar bites, bbq flavour tortilla, chocolate delight bar, chocolate nutty bar and chocolate caramel bar. Basically it's very simple and time efficient. You take a meal replacement shake or bar for breakfast, have a Slim Fast snack or fruit or low calorie snack then for lunch you have another meal replacement, then snack time again and then a 600 low calorie meal for dinner and later have another snack. I will be using Slim Fast for the next two weeks and will be updating and posting again my final results and what I think! If you are participating then don't forget to hashtag #SlimFastChallenge on Twitter! 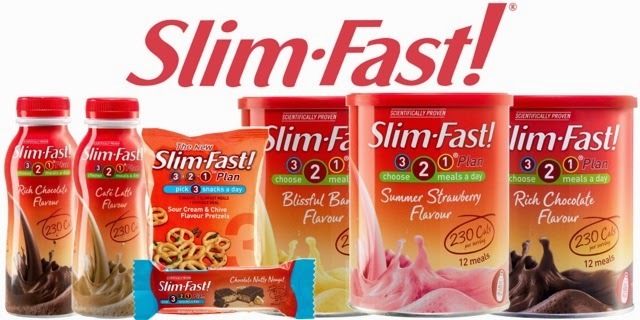 Slim Fast products are available to purchase in Boots or Superdrug.